I created this document with input from Professor Steve Rauch, Terry (Burd) and a number of other people on mvertigo who reviewed this work. It combines information from the science literature, from neurologists and other specialists, and a great deal of the knowledge that we have gained through our own personal experiences here on the forum. This guide outlines how to identify, “survive” and handle chronic migrainous vertigo, otherwise known as vestibular migraine (VM) or migraine associated vertigo (MAV). Migraine is NOT just a bad headache but “a global disturbance of sensory signal processing“. In other words, sensory information – sensations – are distorted and/or intensified. Moreover, some people have a form of migraine that NEVER involves headaches and presents as only non-pain symptoms. If we examine the statistics, migraine affects approximately 12% of the population (16% in women and 8% in men) while Meniere’s disease (MM) affects about 0.2% (or about 2 in every 1,000 people). MM is therefore a relatively rare condition although many with VM are frequently misdiagnosed with MM. When you consider that the second most common symptom of migraine after headache is dizziness, it stands to reason that migraine should seriously be considered in cases of chronic or sporadic unexplained dizziness and vertigo, especially where there is no unilateral (one-sided) fluctuating, progressive hearing loss in the lower ranges. Note, however, that approximately 20-30% of patients with migraine headache exhibit VM. About 20% of VM patients develop hearing loss on one side – evidence of “endorgan damage” in the cochlea. 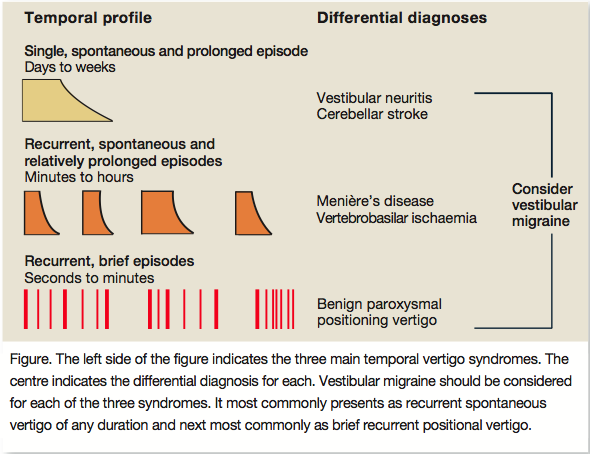 Those patients with VM who mimic Meniere’s syndrome – episodic vertigo lasting 20 min - 24 h plus hearing loss – nearly all gradually develop evidence of endorgan damage (a.k.a. “vestibular hypofunction”). As most of you who have searched for answers will know, there is a huge amount of misinformation and myth about migraine on the internet, from regular doctors, and even some specialists. Worse still, some end up going from doctor to doctor for years never knowing that migraine is the root cause of their dizziness or that it is greatly exacerbating their Meniere’s disease. Conversely, some are given a correct diagnosis but refuse to accept that they are a migraineur despite evidence to the contrary (they are convinced that migraine must produce severe headaches or that migraine could not possibly be the root cause of debilitating dizziness and other frightening neurological symptoms). Still others don’t realise or won’t accept that other illnesses can act as complicating cofactors triggering their migraine brains. There is currently no cure for migraine, which is a genetic disorder, and so there is a huge range of medications and treatments (sometimes expensive, misleading and completely ineffective) on the market to choose from. Knowing where to begin in tackling this can seem like climbing a mountain at first glance. Who do you believe and what drug or treatment do you try? The great news is that we do know through science-based medicine (supported by people’s personal experiences here), that there are some very good ways to fully manage this condition that work. In almost all cases, a person with migraine can rein it in and lead a normal life once they know what they’re dealing with and how to handle it. It took both Terry and I about 3 years to finally work out that migraine was the root problem we were dealing with. We know the frustration, fear, and suffering that it brings in not knowing what is going on and feel very strongly about making this information freely available to other people in hopes that they will avoid the long and winding road in understanding what has happened. In short, we hope this will be a “Vestibular Migraine Survival Guide” that people can use to navigate their way out of the migraine abyss. A person with VM may present in several ways. Someone who has migraine with aura (visual symptoms, numbness or tingling, motor dysfunction) will typically report distinct vertigo attacks, usually lasting minutes to hours associated with nausea that can occur before, during, or after the onset of dizziness. They describe feeling very tired and are very sensitive to light (photophobia). Sensitivity to sound, tinnitus and some hearing impairment may occur. This hearing problem can suggest MM but in the case of VM it typically, but not always, occurs bilaterally (in both ears). Tinnitus is often high-pitched or a roaring within the head whereas in classic MM, it is usually low-pitched and in one ear only. Towards the end of these symptoms, the patient will likely develop a headache or a feeling of pressure in the head. After sleeping several hours, they awaken symptom free. This form of attack is difficult to distinguish from MM; indeed, large studies have shown that 25% to 35% of migraineurs experience episodes of dizziness or vertigo, many of which are indistinguishable from Meniere’s attacks. A more common type of VM and difficult to diagnose is when there are less distinct episodes of vertigo or there is no headache at all. Approximately 50% of vertigo attacks related to migraine occur in headache-free periods. Furthermore, migraine dizziness is often felt as chronic dysequilibrium (the feeling you have walking down the street after too many glasses of wine), lightheadedness, a swimming drunk feeling, floating, or a feeling of being disconnected from the world (also called derealisation). Often a “brain fog” descends and thought processes become more difficult and slower. It may become harder to concentrate and absorb information or follow a conversation. Short term memory may suffer as you struggle to remember words or a person’s name. Feelings of dizziness and vertigo can worsen when you change your posture; however, it differs markedly from BPPV. Nystagmus (eyes pulsing in a particular direction) may also be present with a postural change with VM. People with MAV will often note attacks that are set off by visual stimulation (visual vertigo) or motion. They have difficulties in stores with long aisles and hate fluorescent, flickering or bright lights. Stripes and bold shimmering patterns can also be problematic. For some people, walking outside on a bright sunny day will cause dizziness and a feeling of surrealism requiring dark sunglasses or special contact lenses to stop the effect. Watching a train pass, watching your fingers typing on a keyboard, scrolling movie credits or watching a video game on a computer may provoke dizziness. Even crowds can be a problem. Some are temperature sensitive such that a shower or a cold wind on the head may precipitate a headache or dizziness. Repetitive tasks such as long hours on a computer, or even gardening may set off a person with VM. Around 50% of migraineurs have a history of feeling car sick, became easily sea-sick, or they avoided amusement park rides as children. These problems often lessened or went away when they became an adult but reappeared with the onset of VM. Other triggers include hormonal changes, stress, inconsistent sleep routine (too much, too little, or interrupted), weather changes, certain smells, loud repetitive noises, exercise and travel. Fragrances and certain smells that can trigger attacks include: perfumes, scented personal care items, laundry detergent smells, scented cleaners, out gassing of new materials (plastics, building materials, car interiors) and smoke of any kind. For those with allergies, dust, dust mite, animal dander or mould may also be a trigger. Attacks tend to cluster around holidays due to the stress (both good and bad stress) of new activities, travel itself (jet lag and sitting in a pressurised jet cabin) and dietary changes – most notably from foods like red wine, chocolate, aged cheeses, and smoked meats. Attacks often occur after periods of intense stress (letdown migraine) such as moving house, starting a new job, relationship break down or from dealing with the hospitalisation of a family member. Extended travel by car, especially as a passenger – or for some as the driver – is very stimulating and can be more problematic than flying in a jet. Boat trips and cruises or just playing in waves at the beach can also set off attacks. A migraineur’s list of triggers may be quite long. Some of them, such as lack of sleep, may always lead to a migraine attack while for others, it may take a combination of several triggers to bring on an attack. Patients with VM will typically show depressed mood, heightened anxiety, or mood instability. Many of these people will have seen a psychiatrist, psychologist, or therapist and will often describe themselves as having an “anxious” personality. Some may have a history of depression and/or panic disorder. It’s not uncommon for a patient to be told by a doctor, “you’re just anxious” on examination and that their dizziness is due solely to anxiety or depression. What they do not realise is that more than 50% of patients with vestibular migraine have comorbid psychiatric disorders (see Vestibular Migraine Diagnostic Criteria, 2012). Finally, it can often be found that the first attack is the most severe and of greater intensity and duration than those that follow. Sometimes the initial attack is consistent with vestibular neuritis (VN) followed by a long compensation period. Under normal circumstances an acute attack of VN will last anywhere from 2 days to 6 weeks followed by a period of chronic compensation. Vestibular rehabilitation therapy (VRT) may be necessary and the patient will usually recover completely. In a susceptible migraineur, however, an attack of VN or other viral illnesses such as Bell’s Palsy can be the “Big Bang” that initiates the chronic migrainous vertigo state with no end in sight. The patient may think they are still suffering from VN or labyrinthitis long after it has resolved, but it is migraine that perpetuates their dizziness and keeps them feeling ill. VM patients are also highly susceptible to BPPV (loose ear crystals moving around in the inner ear canals) occurring at a rate 3X greater than any other idiopathic (unknown) cause. A BPPV attack may either provoke the onset of chronic migrainous vertigo or occur sometime after the first migraine episode. It is important to note that many do not realise that migraine can be a chronic condition – that is, there are symptoms that come and go on a continuous basis throughout the weeks and months with a constant background of low-level vestibular and other neurological symptoms. Sometimes they spike and you will have horrendous symptoms for days or weeks and other times you may be much more dizzy than usual for days and then have it tone down again – “back to baseline” as we say. Others are constantly dizzy and feel a persistent rocking sensation or a feeling as though the room is always tilting. The ground may feel like sponge and a person will feel as though they are “bouncing” as they walk. Other common chronic symptoms include neck and shoulder pain, back pain, sinus and face pain, chronic fatigue and symptoms that are misdiagnosed as fibromyalgia. Some experience the headaches of migraine as “tension-type” headaches (TTH) as defined by the IHS. According to some neurologists, TTH should never cause debilitating pain or light sensitivity and those that do are in fact experiencing migraine. Others will feel flu-like symptoms for days but it is not the flu. Chronic migraine also typically causes sleep disruption with such a person waking many times during the night. They may wake feeling unrested, anxious, and run down. Note that migraine produces neck pain in a great many sufferers – sometimes referred to as a “coat hanger” headache that may also involve pain in the trapezius muscle across the shoulders. Pain from the neck refers pain to the head and the back of the eyes again causing confusion about its origin. This can be very misleading because a migraineur with neck pain may think that neck pathology is the root cause behind their dizziness and ill feelings. While it is not the root cause, if repeated attacks of neck pain occur (called “migraine neckache”), trigger points can form in the neck setting up a chronic state of pain and dysequilibrium. Trigger points are tight balls of tensed muscle or muscle spasm that are very painful to the touch. The muscle spasm inhibits proper movement of spinal processes beneath it in the neck further adding to the pain and may also produce significant nerve irritation. Taken together, and left untreated, this all acts as a potential chronic migraine trigger. And so a nasty situation is set up where migraine continues to cause neck pain and resultant trigger points and stiff neck joints triggers further migraine attacks. If you feel this is a problem for you, seek out the advice and treatment from a qualified physiotherapist/ physical therapist. This type of problem usually responds to treatment very quickly. The migraine lifestyle and diet includes three parts. By following these steps, around 40% of migraineurs achieve excellent results and symptoms resolve. (1) Regular schedule – every day should look like every other day. You should eat regular healthy meals and never skip one. Make sure you keep a regular sleeping pattern EVERY day, going to bed at the exact same time every night and allowing for about 8–9 hours of sleep. You should get regular daily exercise even if it’s just a walk to the end of the block and back again. Ideally you should aim for 30 minutes of aerobic exercise. Because more vigorous or intense exercise can itself be a trigger, you may need to start off very slowly increasing it incrementally over time until it is a daily activity and does not trigger attacks. Drink about 2–3 litres (about 8–12 cups) of water daily if you can; a migraine brain must stay well-hydrated. (2) General medical “tune-up” – migraine symptoms are more likely to flare if there are other medical/physiological stresses on your system. Migraineurs should work with their other medical professionals if necessary to get control of other health problems such as allergies, food intolerance, thyroid, blood pressure, blood glucose, and hormone problems, or any other obvious vitamin/ mineral deficiencies. Colds, the flu, and other viral infections are notorious for triggering nasty attacks and so good personal hygiene is key to reducing risk of infection (e.g. wash your hands often and avoid touching your eyes, nose, or mouth during flu season). In order to determine if migraine is the problem, a person must be willing and determined to make a concerted effort to identify triggers. Note that triggers do not cause migraine, but ignite it, like putting a match to dry kindling and so identifying them is critical. For example, keeping an ongoing diary of daily symptoms and recording all possible triggers is a great way to find patterns and isolate them. Others may need to use an elimination diet to isolate food triggers. Whatever the method, some may only do so half-heartedly with no definitive results to work with and will thus incorrectly rule out migraine. Accurate and useful results require putting in some time and effort. Dr Nicholas Silver in the UK is the neurologist migraineurs see when they have failed to gain migraine control under the supervision of previous neurologists. He is extremely systematic and methodical in helping people gain control. He says the main reasons that people fail – even when they are on a migraine preventive drug – is because patients are still using caffeine in some form (coffee, tea, green tea, chocolate, colas) or they are using painkillers. Some nasal decongestants can act similarly to perpetuate the condition. A chronic migraineur should NEVER use any painkillers – not ibuprofen, paracetamol, Tylenol, or aspirin and definitely not the more heavy-duty ones such as the opiates unless it is an emergency but no more than four times per year. Even one cup of caffeinated tea per week can be enough to perpetuate chronic migraine, so NO CAFFEINE. If you’re using painkillers now, the best way to get off is to go “cold turkey”. Headaches may get worse over the first week and should then ease off. Use other methods to work with headaches such as cold packs etc. If the migraine lifestyle above is followed and you can pinpoint your triggers and develop a firm foundation and stick with it, then 40% will see their symptoms resolve and you may only deal with the odd flare-up here and there. For the other 60%, a preventative migraine medication is needed. The author can personally attest to the nightmare painkiller (aspirin) overuse can bring. There are currently several FDA (or equivalent)-approved evidence-based medications and nearly 100 off-label medications commonly used for migraine prevention. Abortive medications (e.g. triptans) are not known to be of much use to someone who suffers with MAV and may actually perpetuate the problem and so a preventative medication is used. According to Drs Nicholas Silver (who prefers medications that encourage a proper sleep cycle) and Steve Rauch, migraine medications should be started at very low doses and increased slowly over weeks or months until the headache and dizziness goes or the recommended tolerated dose is reached. One should not be put off by the label “antidepressant” or “anticonvulsant”. The dose required may be far below what someone with clinical depression or epilepsy would need. Once stable, you remain on the medication for one year and then it may be possible to come off the drug over another 4-month reduction period at which point a migraineur can remain in remission without medication but still following a migraine lifestyle. Others may need to stay on their preventive for many years or for life. Note that migraine medications are NOT a substitute for the above lifestyle modifications but are a supplement to them. When you find an effective preventive medication, however, you will likely be much less vulnerable or susceptible to triggers, including dietary triggers. •	Benzodiazepines – most find these very effective, particularly low doses of valium which has both anti-anxiety and anticonvulsant properties. Dr Timothy Hain recommends low-dose clonazepam which avoids dependence. Note that these treatments have very little or no evidence for efficacy beyond personal anecdotes and/or a possible placebo effect. However, they may give some temporary relief or even long-lasting relief. The following journal article is one you can print off and take with you when you visit your doctor. It’s from Medicine Today, an information source for Australian physicians. The article covers all of the major bases, and is written in language that doctors like. In other words, if you suspect you have VM but have a doctor who you think is not on the same page, then print this off and take it with you to your appointment. There is a nice little differential diagnosis diagram in it that will help your doctor and you in working out what it is you’re dealing with. The only area the article falls short, in my opinion, is in the use of SSRIs as a suitable first line (medicine) treatment. There isn’t much in the way of hard evidence for SSRIs and VM (clinical trials) which is why it’s not here. For that we rely on expert opinion (Drs Baloh, Newman, and Tusa) and case studies reported on the forum. My first post...I'm 2 years in and I'm desperate for some answers, help please? Help please guys... Do I have MAV? How do you know when there is something else going on? Anyone suspect autoimmune disease as trigger of VM? Site news: I've added a personalised greeting! Scott -only just read once - need to look again to take it all in. Just wanted to say great work and THANK YOU. Thanks so much for all your good work Scott. Great job and thanks for doing this! I took a cursory glance at the info and it looks like you have all the bases covered, Scott, but I will try to read it in more depth to see if I can think of anything else. This whole MAV thing is brand new to me. I’ve been having what I’ve called “vertigo attacks” for years but until yesterday I had no idea what was causing them or what could be done about it. Yesterday, I consulted with an ENT who interpreted data from a bunch of tests I had done last week and the verdict is “vestibular migraine”. I just want to share my deep appreciation for this BB and the enlightening information contained herein. I’m about to embark on a new path of trying to identify and manage triggers. Thanks! This post was incredibly helpful to me in addition to the discussions with the Neurologists. I have suffered with chronic dizziness, weird neurological symptoms, and various forms of headaches for 3 years. I have received diagnoses such as Chronic Fatigue, Fibromyalgia, and Meniere’s (my most recent diagnosis). I recently saw a new allergist to help me get my raging Fall allergies under control, and she is referring me to a neurologist to ascertain possible Migraine/MAV. After weeks of reading, I’m inclined to say that my symptom profile and experiences fall into the MAV category even though I received results of a hearing test from an ENT showing some bi-lateral hearing loss (the ENT’s reason for diagnosing me with Meniere’s and not Vestibular Migraines). I see from multiple sources that MAV most certainly can include bi-lateral hearing loss. I don’t know why I didn’t consider this sooner since migraines run in my family. This has been a nightmarish, life changing experience - I no longer participate in many activities and am only able to work around 10 hours per week. My functioning is so unpredictable, and I’ve worked so hard to even have improved to where I am now. I am now considering taking a leave of absence to concentrate on gaining better control over my health. It’s just gotta get better!! Thank you for such an informative and supportive forum. This is such a good post. Thank you very much. I finally read the whole thing. Wow. So I got chills reading your post. I have suffered for almost 3 years now with what they are “thinking” may be MAV. After 2 years of testing, $30,000 out of pocket above insurance, and seeing about everyone in the book including the entire Scottsdale Mayo clinic…we are still at a maybe. So many if not most of all the symptoms you write about are me to a “T”. Sure, we all experience other symptoms that trigger dizziness or we “think” may be a trigger, but nonetheless often frightening. The difficult thing for me is that the migraine is not the underlying cause. Usually there is some type of deficiency in the body which makes one prone to migraine and the symptoms associated with them. Including the tinnitus, I would get spasms in the back of my neck (feels like my brain stem) which would really freak me out at first. After trying topomax (ugh), valium (sleepy even on 1mg), and then verapamil, I slowly weened of all meds except for the occasional Meclizine when I need it. The sublingual helps quite a bit most of the time. My worst trigger is the fluorescent lighting in big box stores (costco, grocery, Home Depot, etc.). Just took them all out of my home as well, what a help. Barometric changes when traveling to higher altitudes also irritates the situation, or higher humidity at first. The body adapts usually, so most nausea is temporary. This is such an excellent article Scott. I am grateful you asked for my input and ideas. for this comprehensive and informative post. It captures everything in one place. I recognize Burd from the Meniere’s forum- she suggested I may have MAV at a time where I and my neurologist thought it might be Meniere’s. After my symptoms became chronic (never headaches tho’) I began to suspect MAV. I was diagnosed by Dr. Baloh about a year ago. In a nutshell, I’ve had lots of testing for allergies (food, standard allergens etc all negative), tried some food avoidance diet, hormonal imbalance testing, and tried some different drugs, nothing seemed to make any difference. I’m now taking citalopram (Celexa), but it seems to have little effect (8 months now), and I’ve been on partial disability since last May. I’m taking a Mindfulness Based Stress Reduction (MBSR) course through my local hospital (see Jon Kabat-Zinn’s book: Full Catastrophe Living), and that helps with better sleep and better handling of stress, and my general outlook. I’ll keep that up. I’m glad this Guide and Burd have helped you to get a better grip on what it is that’s been going on but so frustrating that trigger avoidance and the meds you’ve used so far haven’t nipped this in the bud. Maybe you can let us know what meds you’ve tried so far and others on the forum can chime in to come up with a game plan to suggest to your doctor. Unfortunately, it can be a long boring road finding the right combo of trigger avoidance and meds to knock this out, however, keep on steering the ship until you find something that works. BTW, I did the same course you’re doing now last year. It was great and I highly recommend it to anyone. The whole thing is evidence-based as well and first began in Massachusetts from memory out of one of the universities there. I still do the meditations occasionally but not as often as I should. Great KTC. Very glad this will help you in this way and inform your family about what it is that is going on. It’s the invisible nightmare really isn’t it? You look fine on the outside but can feel like someone threw you under a bus on the inside. Funny how people find it hard to commiserate unless an arm is missing or there is really something obviously visual going on. Thank you for such a concise and thorough guide. I printed it out and highlighted the most important parts that pertain to me for my husband (who hates to read). Just perfect, thank you!! Many many thanks for your time and for putting all this information together , you are guiding me through my recovery road. Sending you through my meditations the best wishes and good health. According to the book “Heal Your Headache” by David Buchoolz, painkillers such as IB Profen are OK for migraineours to take (once headaches are under control)- it’s the meds like Excedrin and anything with caffiene, decongestants, (and triptans like Maxalt/Imitrex) that he warns to stay away from. IB Profen is not a rebound-causing med. It is perfectly ok to take IB Profen for a headache once you have gotten them under control through the diet. He says if we are having to take it more than twice a month, then our headaches AREN’T under control & THEN we are to cease using any meds until they are controlled- BUT that once they are, we can use IB Profen for aches/pains and the occasional headache (such as for women during their menstration.) The point of not taking IB Profen in the beginning is to get off all quick-fix meds & control the headaches first. Once they are controlled, since IB Profen is not rebound-causing like the others I mentioned above are, IB Profen can be used for other purposes or for the occasional headache. I just wanted to clarify this- as I just re-read this part in the book, and it conflicts with what this survival guide says. I am currently taking IB Profen to help with inflammation in my sinuses due to allergies, since I cannot take a decongestant. It is important to get the right info out there, but the survival guide warns against IB Profen without noting that it is OK once headaches are controlled. I am 4 months headache-free as a result of following the diet, and I take IB Profen as needed for joint pain, menstration symptoms, and to reduce inflammation in sinuses until this allergy season subsides. The rest of the info is very helpful, but you may want to clarify that part about IB Profen. Yes, I am aware of this from Buchholz. He is the only person I have heard say this however. The consensus is that ALL pain killers can cause rebound headache in some people. I have not noticed this phenomenon in myself but it happens in others. It might be worth exploring and taking the advice of Dr Silver and not use pain killers unless it’s a one-off occasion to see how you respond. I just wanted to say the biggest thank you for this survival guide. It was such a relief to read a perfect summary and recognise myself in so many ways. I have sent this guide to all my family, friends and my colleagues so that they’re able to better understand the condition. There were so many people coming back to me saying that they had no idea migraine could cause such different symptoms, and that after reading the article, they now understand what I’ve been going through. Thank you- finding that article has been fantastic for me. Hi Lou – really pleased this has helped you like this. I think when I wrote this I was thinking about it in terms of being something people could print off and give to family members who didn’t understand what was going on and why. Hope you are finding ways to manage this now and get back to leading a more normal life. I have been reading through this forum for a few weeks, ever since getting my actual diagnosis of MAV. All I can say at this point is thank God I AM NOT ALONE! Thanks to you and everyone on this forum I have gained insight and strength. I will beat this. Have been out of work now for almost 8 weeks. Very med sensitive but now having some response with topamax, xanax, vitamin supplements, nutrition and yoga. Will be titrating up on the topa tomorrow… Have also just finished reading the books and articles you have recommended. Reading is slow because my eyes are still somewhat blurry. Thanks for a wonderful and informative site.